Find/Replace dialog allows multiple find/replace operations on whole document or just one part of document. Enter expression to find in "Find what" field, and replacement expression in "Replace with" field. Click on "Find" to search for a first occurrence of an expression, and then "Find Next" for the next one. Click "Replace" for replacement of current expression, or "Replace all" for replacement of all occurrences. Result is visible in a preview field. 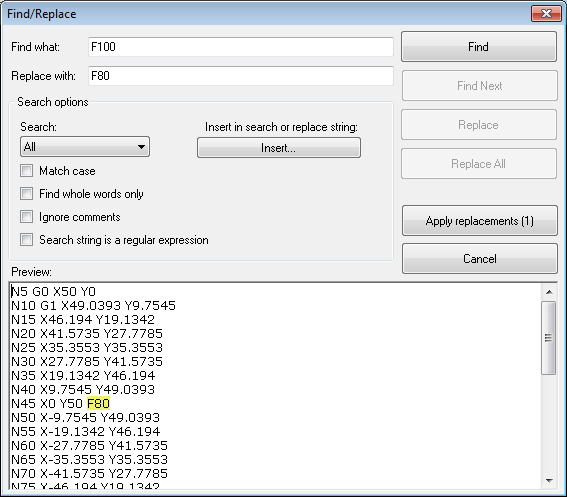 "Apply replacements" applies all made replacements to CNC code. You can search All code, just down, just up, or a selection. Use "Insert..." button to insert paragraph or tab characters in expressions. Right click in "Preview" field and select "Go to selected line" to go to selected line in CNC document.